Welcome to TREAT, award-winning energy audit software for comprehensive energy analysis and building modeling. TREAT stands for Targeted Retrofit Energy Analysis Tool. The home energy audit software the industry has come to depend on for versatility and accuracy just keeps getting better. Now – enjoy a free 30-day trial to TREAT and heat up your home energy audit and contracting business today! TREAT is winner of the prestigious R&D 100 award and still the only energy audit software approved by the DOE for all residential housing types – including multifamily. TREAT is market tested, with thousands of users enjoying accurate results for over a decade of supporting whole house energy audits. TREAT is RESNET accredited. With thorough building material libraries, single-family and multifamily versions, and the ability to project savings from combined retrofits, TREAT is a comprehensive and flexible software platform for your energy audit efforts. 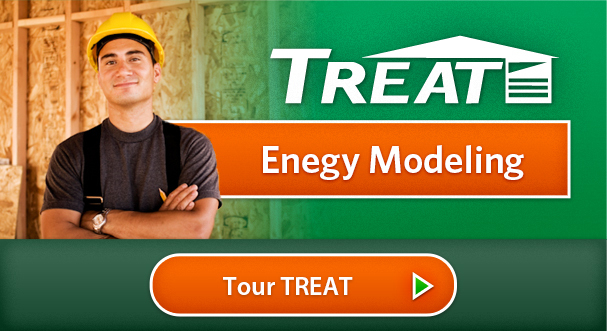 TREAT features onboard SUNREL energy modeling, dynamic links to local weather logs, a unique model “true-up” feature, and concise energy savings reports to ensure that projected energy savings are reliable and that contractors convert retrofit sales with every house call. To get you up and running quickly, we offer free TREAT Sneak Peek webinars. Want to become a TREAT expert? Register for one of our TREAT training sessions. NYCHA uses TREAT software and enlisted our Training Academy to help prioritize building improvements. RESNET Accreditation – TREAT 3.5 remains RESNET Accredited as an Existing Homes Tax Credit Compliance Tool.